While providing effective CPR to patients is a fulfilling part of the job, it can transfer contaminates between yourself and the patient. The Laerdal Pocket Mask with Gloves, Wipe and Hard Yellow Case makes CPR safer by protecting you and the patient. Using a high-quality 3M Filtrete hydrophobic filter under a one-way valve, the Laerdal's Pocket Mask filters out contaminates (e.g. airborne pathogens, liquids and secretions) in the air. If you had been performing mouth-to-mouth resuscitation, these contaminates might have otherwise been transferred between yourself and the patient. 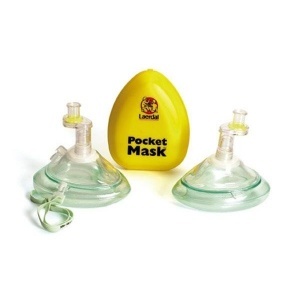 The Laerdal Pocket Mask with Gloves, Wipe and Hard Yellow Case will be subject to a delivery time of 3 - 4 working days after the point of order. For more information, contact our Customer Care Team at 020 7501 0593.